Horizons physical education curriculum for Pre-Kindergarten and 2nd Graders is fundamentally a time of learning about motion, physical movement concepts, fitness, play and even discipleship in a Christian lifestyle. 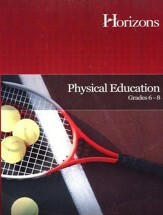 Lessons include goals and outcomes, teaching methods, information on developmental stages, diagrams describing challenge courses and activities, lesson plans, written instructions and all other information parents and teachers need to know to create a holistic physical education program for their students. Some activities are designed for multiple children. 440 pages, softcover. Grades Prek-2. Horizon's multidimensional Physical Education Curriculum looks to goals beyond that of pure physical fitness. Physical Education helps children to learn how to use the body as an instrument for God, a goal which acts as the end for other objectives such as psychomotor skills, motor proficiency, expressive movement, knowledge, understanding the human body and decisions. The first lesson includes notes for using the curriculum, including physical education, goals, curriculum model, plans, administration notes and other teaching helps, all of which are given from a Christian perspective. An entire chapter for Christian schools is included with reproducible forms and information on working with children with disabilities. Each grade's chapter includes information on developing, creating, and producing control skills, motor abilities and specialized sport skills, and contains notes on helping students to build strength and flexibility. Exercises, games, songs, and various other activities are described and some illustrated; many include ideas for which two or multiple children will be necessary. Integrating actual physical activities with teaching that accompanies it-on the body, various related skills (balance and miming), Scripture-related lessons, communication skills, defined new sports terms, and other non-active content, make for a complete, integrated curriculum. 573 pages, softcover. Grades 3-5. Horizon's multidimensional Physical Education Curriculum looks to goals beyond that of pure physical fitness. Physical Education helps children to learn how to use the body as an instrument for God, a goal which acts as the end for other objectives such as fitness & sports education, commitment, competition and conduct. The first lesson includes notes for using the curriculum, including physical education, goals, curriculum model, plans, administration notes and other teaching helps, all of which are given from a Christian perspective. Each grade's chapter includes information on developing, creating, and producing control skills, motor abilities and specialized sport skills, and contains notes on helping students to build strength and flexibility. Exercises, weight-lifting guides, BMI and other fitness evaluation charts, drills, stewardship lessons and various other activities are described and some illustrated; many include ideas for which two or multiple students will be necessary. 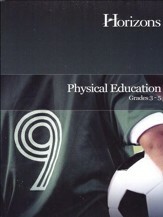 Physical Education integrates actual physical activities with teaching on the total health of the body, including eating habits, Scripture-related lessons, communication skills, defined new sports terms, and other non-active content. 496 pages, softcover. Grades 6-8. Horizon's multidimensional Physical Education Curriculum looks to goals beyond that of pure physical fitness. Physical Education helps students to learn how to use the body as an instrument for God, a goal which acts as the end for other objectives such as fitness & sports education, a commitment to fitness, competition and sports conduct. The first lesson includes notes for using the curriculum, including physical education, goals, curriculum model, plans, administration notes and other teaching helps, all of which are given from a Christian perspective. Chapters include information on administrative factors in high school fitness education, extra curricular intramurals, clubs and interscholastic athletics, team sports, specialized sport skills, and notes on helping students to build strength and flexibility. 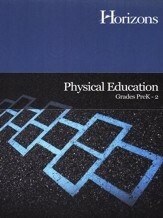 Over 40 Exercises, fitness evaluation charts, drills, stewardship lessons and various other activities are described and illustrated; many include ideas for which two or multiple students will be necessary. 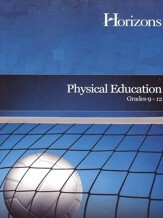 Physical Education integrates actual physical activities with teaching on the total health of the body, Scripture-related lessons, communication skills, new sports terminology, and other non-active content. 733 pages, softcover. Grades 9-12.